Last year I did make a posting about counting all the provinces I had been in Thailand. And I saw I have been to (stayed in) 48 provinces out of the 76. So in the coming months I will travel via my postings from the most southern province I have been to the most northern province, with some photos and information about each province. This is part 25 of the 47 (out of the 77) provinces where I have at least stayed overnight once. 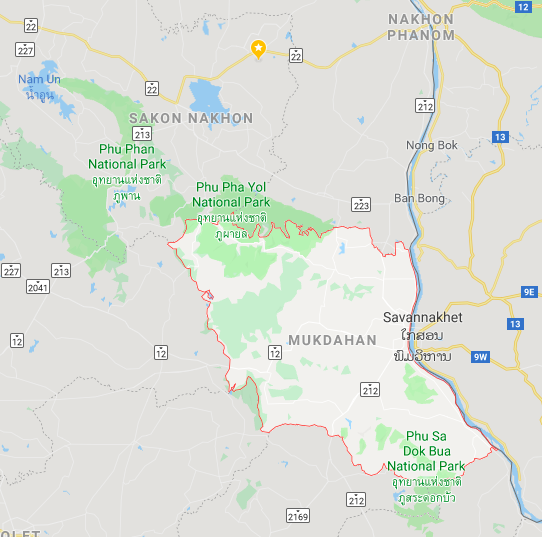 Mukdahan province is one of Thailands most Eastern provinces in North-East Thailand and borders along the Mekong River as border between Thailand and Laos. The capital town is of course Mukdahan. The most tourists will know Mukdahan as place to go to Savanakhet in Laos (where is a Thai consulate) or to travel via Laos to Vietnam. Mukdahan town was originally the place to take the ferry to Laos, you can still see the buildings and Immigration office along the Mekong River. And for Thai people there is conveniently a huge casino in Savanakhet (Laos) called Savan Vegas. But since the opening of the Thai-Lao Friendship bridge crossing the mighty Mekong River I assume less and less people will actually visit Mukdahan. For me personally it was probably somewhere in 2011 to go to Mukdahan to visit a friend and get a new visa in Savanakhet (Laos). Later I would come back a few times, I like Mukdahan although there is for tourists actually not much to do or see. But I love the Mekong River. And for motorbike riding in North-East Thailand Mukdahan makes a good stop with hotels, restaurants, coffee shops and some pubs. Photo above is the view over Mukdahan town and the Mekong River with Laos, seen from Phu Pha Thoep. How to get to Mukdahan province? 🚘 🛵 from Bangkok via route 1, route 2 and 12. ✈️ nearest Airport is in Ubon Ratchathani. 🚞 nearest Train Station would be in Khon Kaen, Udon Thani or Ubon Ratchathani.